Do you have a lot of knowledge to share? Would you like to make money while providing people with valuable information? An e-book is one of the easiest ways to start making money online! 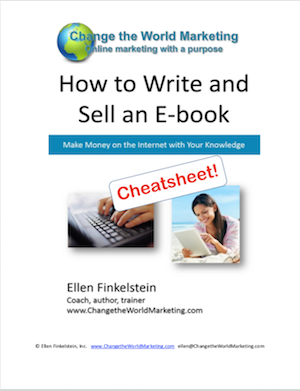 My cheatsheet, How to Write and Sell an E-book gives you the 7 steps you need to take! You'll also get valuable marketing strategies that will take you from start to finish. We keep your information private. You will also receive a free subscription to the Change the World Marketing newsletter, including the "Daily Hot Tip," as well as information and offers relevant to online entrepreneurs.